With these royal coach design place card holder favours, when your guests arrive their carriage awaits. Whether you're having a Cinderella theme or just want to put a touch of happily ever after in your day, your guests will feel like they've stepped right into a fairy tale when they arrive and see their seating assignments displayed in these storybook-inspired favours. Magical as place card holders or for pictures and notes after the event is through, each measures 3.25" x 1.25" and has a carved white poly resin base in the shape of an elegant, rose-enhanced coach with a heart shaped design and a dramatic crown top with rhinestone accents and a coiled silver metal wire holder at its top. 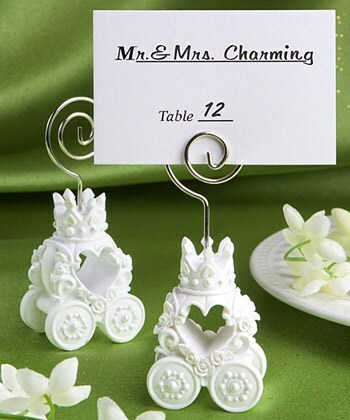 These carriage design favours come bulk packed in a poly bag with blank place cards included.